Comment	 The Large Magellanic Cloud in the constellation Dorado hosts many interesting features. 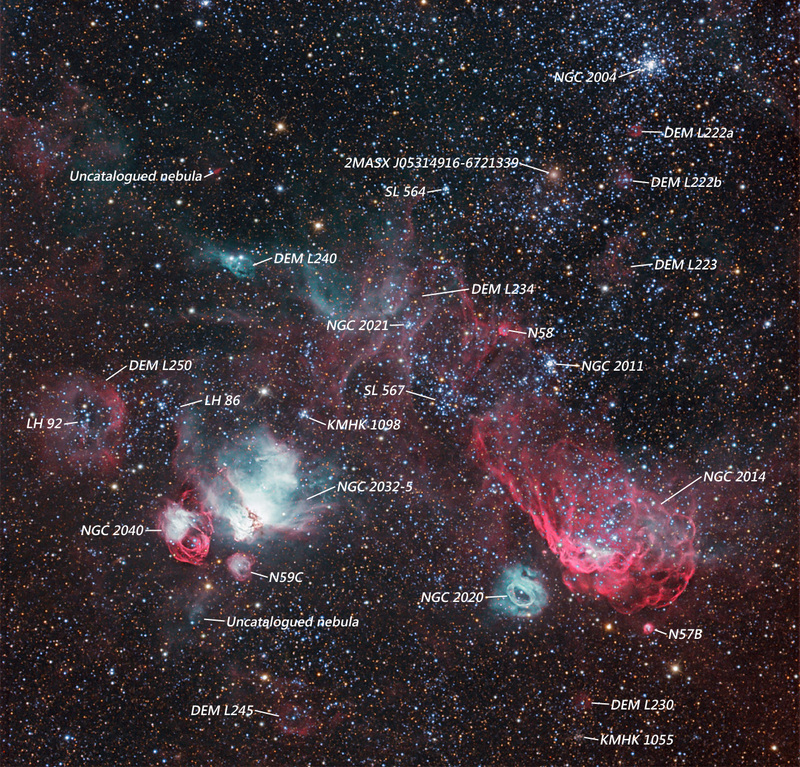 While the region is dominated by the magnificent Tarantula Nebula (NGC2070), the area surrounding the Southern Seagull Nebula deserves attention. The Seagull is the bright nebulae at top right (comprising of NGC2029, NGC2032 and NGC2035) and is rich in oxygen and hydrogen atoms. To the left, the teal coloured doughnut shaped nebula is NGC2020, a fascinating structure which contrasts the overall scene. Finally to the left of NGC2020 is the open cluster NGC2014. NGC2014 contains a cluster of hot, young stars, almost hidden in the brightest part of the nebula. The energy from these stars is consumed by hydrogen and produces the distinctive red glow around the cluster.